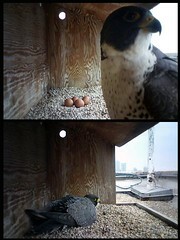 The 1130 South Michigan Falcon Cam is live! It’s a gorgeous camera. We can actually read leg bands with this camera, so that will be nice for next year. There must either be something shiny on the camera or it must make a little bit of noise, because I noticed that Helen seemed pretty keen on glaring directly into the lens a few times before settling down on her eggs. For those curious, there is a peregrine pellet right in front of the nest. It’s that blackish round thing. Peregrine pellets aren’t as interesting as owl pellets because they contain mostly feathers. So, if you watch the nestcam and it looks like the adult is choking, don’t worry, they are probably just regurgitating a pellet. Another cool thing — Helen and Mr. M. have such radically different breast plumage, I can tell on the webcam this is Helen without seeing her bands. ~ by Steph on April 9, 2013.